Over the last two or three years some excellent books have been published about designing and building layout dioramas. 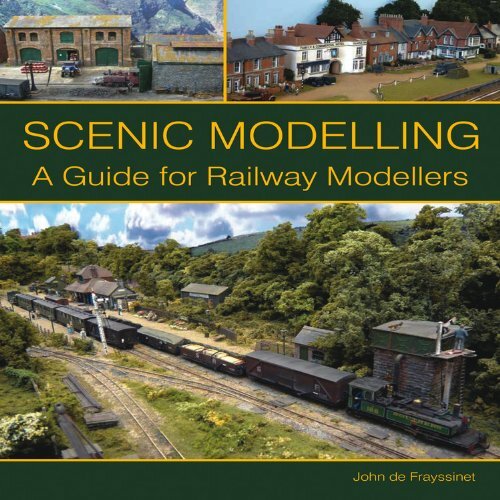 Scenic Modelling A Guide for Railway Modellers in my view is up there with the best of them. John de Frayssinet has produced an invaluable and well-illustrated book describing landscape modelling from a new perspective. It explains in detail how to design and construct a model railway in a convincing and pleasing landscape. The author has always considered that model railway dioramas are an art form and this book is brimming with advice and tips that will allow the modeller to create true-to-life landscapes. There are plenty of examples from well known layouts including John de Frassinet’s own magnificent Cliffhanger and his snow clad Bratton Fleming. Another example is one of my own favourites Reseau Breton by Gordon Gravett, a really superb piece of rural France. John de Frayssinet’s interest in model railways began when he was a small child. He discovered the narrow-gauge Talyllyn Railway before it went into preservation and this began a life-long interest in ‘wayward’ railways. John has always striven to create a ‘railway in landscape’ rather than just a train set. He built his first scenic diorama in 1959 and, apart from building models for clients,he has built the award-winning County Gate narrow gauge diorama followed by Bratton Fleming Snow Scene and his new diorama, Cliffhanger. John has written extensively for yachting, aviation and model railway magazines and actively campaigns for good disabled access at model railway exhibitions.